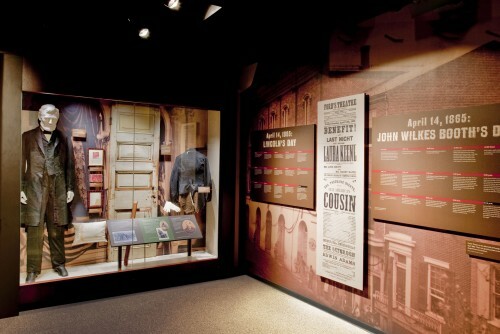 The frock coat, waistcoat, trousers, tie and boots were owned by President Abraham Lincoln and possibly worn to Ford’s Theatre the night he was assassinated, April 14, 1865. 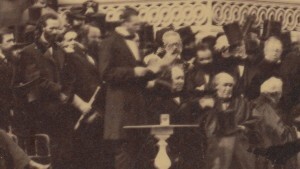 After the unconscious President was moved the Petersen House, doctors removed Lincoln’s coat, tie and trousers, but had to cut off his shirt. Lincoln’s boots were custom-made by shoemaker Peter Kahler of New York from a tracing of Lincoln’s feet. They are a size 14. 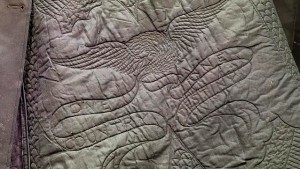 The hand-embroidered lining featured an eagle carrying a banner reading “One Country, One Destiny.” The phrase comes from an 1837 speech given by one of Lincoln’s role models, Senator Daniel Webster. After Lincoln’s assassination, Mary Lincoln bequeathed the coat to the Lincolns’ favorite doorman, Alphonse Donn. 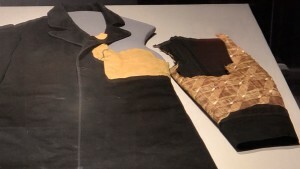 The Donn family held the coat for over a century, allowing curious visitors to cut swatches of the bloodstained lining. Eventually souvenir seekers did so much damage that the sleeve separated from the body of the coat. Because of its fragile condition, the coat is not currently on display, but you can explore a photo below. The Museum contains a replica. Abraham Lincoln was wearing this wool and silk-lined coat when he was assassinated by John Wilkes Booth in 1865. The silk lining bears a hand-embroidered detail: an eagle with a banner reading “One Country, One Destiny,” making Brooks Brothers’s gift meaningful for Lincoln. Lincoln’s blood stained the left shoulder. Over the years, people cut swatches of the fabric for themselves, eventually taking so much that the sleeve separated from the coat. 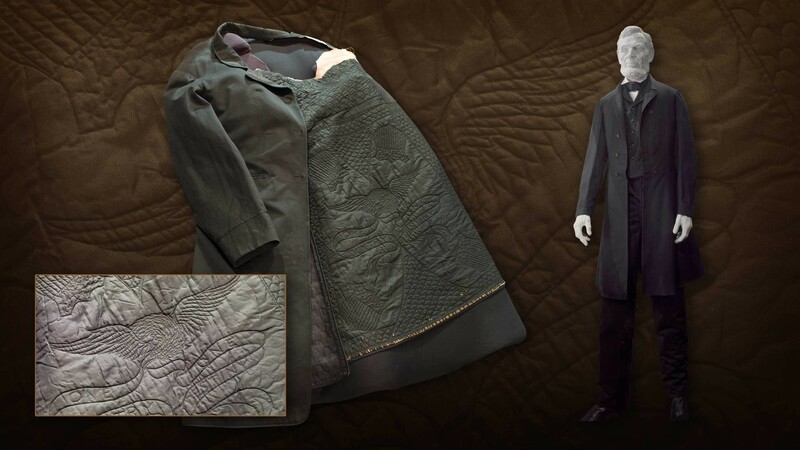 Lincoln wore this coat as he gave his Second Inaugural Address on March 4, 1865, and again the night of his assassination. The night of April 14, 1865 forever changed our national history. Together, Ford's Theatre Society and the National Park Service partner to protect the artifacts from that night. Through these object, we can better understand how that single event was transformative for our nation. Give to Ford's Theatre to help continue sharing the stories that shaped a nation.